An evocative story of an all-metal world, its argon-breathing inhabitants, and a scientist who performs the ultimate self-examination. First Appeared In: Eclipse Two. Nominated for a BSFA. Story starts at 4 Minutes, 40 Seconds. This release features edgy new stories by hot new talents, and old favorites from Poul Anderson and Ursula K. Le Guin. 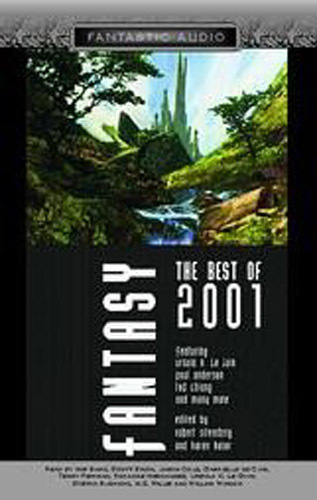 Silverberg and Haber say it best: “The present anthology is intended to show reach and range as it is demonstrated nowadays in the shorter forms of fiction.” You will find very little that is formulaic here, although we have not ignored any of fantasy’s great traditions. There are stories set in the familiar quasi-medieval worlds to which modern readers are accustomed, and others rooted in the authentic myth-constructs of high antiquity, and several that depend for their power on the juxtaposition of fantastic situations and terribly contemporary aspects of modern life on Earth. There are philosophical and theological speculations. There is even one science-fiction story — although one that carries scientific thinking to a fantastic extreme — by way of showing that science-fiction, rather than being a genre apart, is simply one of the many branches of fantasy literature. These stories — which we think are the best short fantasies published in 2001 — are reassuring proof of fantasy’s eternal power even in this technological age. Leon is a former coma victim, who has gone experimental medical treatment to repair the massive trauma his brain recieved after he was trapped under ice for more than an hour. He’s regained consciousness, found he has all of his faculties back and a whole lot more. In the tradition of Daniel Keyes’ Flowers For Algernon. Originally published in “Isaac Asimov’s Science Fiction Magazine” in 1991.